Again an unnecessary defeat for our Rossoblu-team. The match started perfectly with the opening-goal of De Maio already in the third minute of the match. Right after the goal Genoa was a few times close to the 2nd goal which probably would decide the match. A mistake of Sturaro and De Maio gave Sau the opportunity to score the equalizer in the 37th minute: 1-1 at halftime. In the 37th minute of the 2nd half another big mistake in the defense of Genoa, this time by De Maio and Burdisso, gave Sau again the chance to score but he was stopped by Mattia Perin the rebound however was scored by Ibarbo: 1-2. In the 95th minute Gilardino scored the equalizer in the last second of the match, but the goal was regulary annulated because of off-side. Again a defeat to the Gasp-boys who left the field without saying goodbye to the fans. Again a defeat for our Genoa after a good match. After 90 minutes the Gasp-boys were still in the lead by 0-1 after a goal of Gilardino (his 14th). In the 92nd minute Immobile scored the equalizer, which was the most honest result for this match. Everybody happy with a draw ? Not Alessio Cerci because with a great goal in the 7 of the goal behind Mattia Perin he scored 2-1 in the 94th and last minute of the match. Genoa already lost 7 points in injurytime this season against Cagliari (2-1 Sau in the 92nd minute), Atalanta (1-1 De Luca in the 94th minute), Chievo (2-1, Paloschi in the 93rd minute) and now Torino (2-1 by goals of Immobile in the 92nd and Cerci in the 94th minute). Saturday we can have revanche for the lost match against Cagliari with the unbelievable red card of referee Giacomelli to Thomas Manfredini. 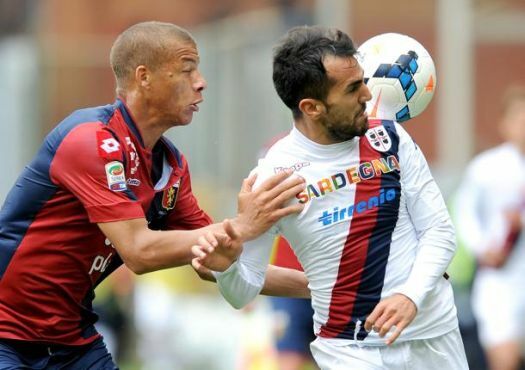 We need 1 point to be 100% sure of another year in Serie A. Forza Genoa! Just as the match against Juventus the Gasp-boys played very good, deserved at least a draw but finished the match with a defeat. With Fetfatzidis and Burdisso back in the line-up we started very passioned and aggressive against Milan. 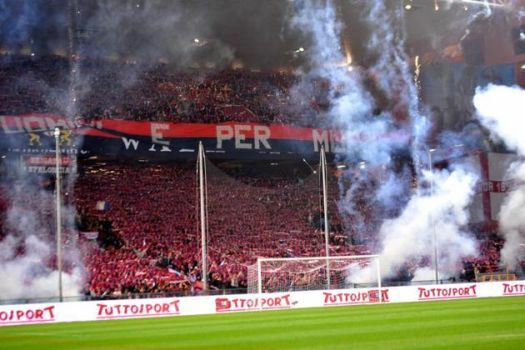 The openinggoal however was scored by Taarabt after a great run from the midfield, the only shot of Milan on the goal of Mattia Perin in the first half. 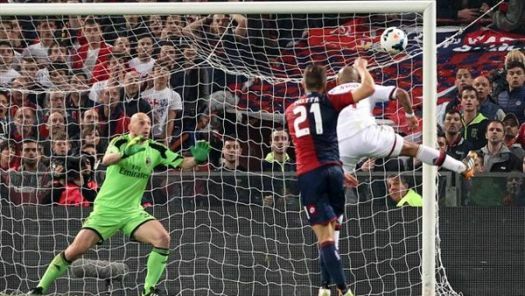 After the goal Genoa became even more stronger but did not succeed in scoring the equalizer. In the 56th minute a counter of Milan gave Honda the chance to double the score, which happened because Sculli couldn’t touch the ball out of the goal: 0-2. With Centurion in the team Genoa played even more offensive (cornerscore: 8-1 to Genoa) and Marco Motta scored 1-2 with a great shot in the 73rd minute. A few minutes later again Motta and Fetfatzidis were close to the equalizer but we did not get what we deserved also because referee Banti helped the big team of Milan a little to whistle every time Balotelli felt down for nothing and to give only 4 minutes of injurytime while it should be at least 7.